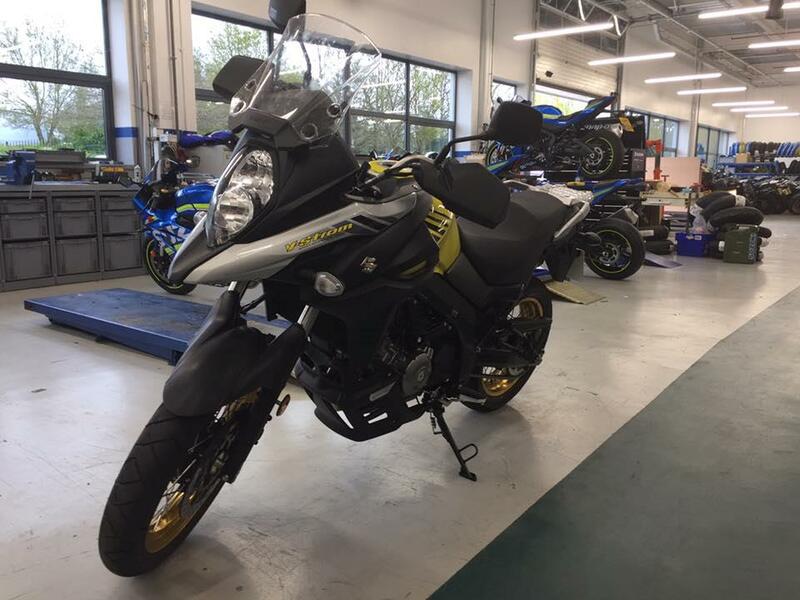 The V-Strom headed back to Suzuki for its 600-mile service on Thursday, although by the time I’d reached Suzuki GB HQ in Milton Keynes the odometer was reading well over 800 miles – I’ve got right stuck in to my #ride5000miles challenge! Relatively quick job for SGB, done in a couple of hours and I was back up the road, by the time I got home I was just a few miles short of hitting my first 1000. After not knowing what to think initially, I’m really starting to enjoy my time with the bike now. I’d not ridden in a couple of months before I jumped on it so I was a bit rusty, but once I got back into the swing of things I realised that not only could the bike be perfect for my 138-mile round trip commute but it also holds up pretty well on a country road blast. I went out for a ride with my Dad, who was riding his 2015 ZX-10R, and although he wasn’t particularly going for it (he’d have obviously left the poor Strom for dead if he was!) I still had to push the 650 quite hard to keep him in sight while also trying to remember I’m still in the running in period. After almost 1000 miles, I’m starting to figure what I’d like to change on the bike in coming months. The first thing I’ll be fitting is luggage, a must-have for the longer trips I’ll be doing in the coming weeks including taking the bike over to the Isle of Man for the TT. I’ll also be getting a centrestand – something that in my opinon should come as standard on any adventure bike – to make cleaning and maintenance my end a bit easier. I’m also thinking about a new exhaust to see if I can eek out a bit more power, and of course the sound of the V-Twin motor has to be appreciated! Then there’s the tyres, the Bridgestone OEM rubber doesn’t seem too bad, but I am lacking a bit of feeling in corners so I’ll stick something else on just to see. The standard screen seems big enough, but it was delivered to me on the lowest setting. I wanted to get some miles under my belt with the bike unchanged, but with the screen on this setting I’m getting quite a lot of wind to my face so I’ll be adjusting that to the highest of the three settings when I next get chance. In theory, that should be a quick five-minute job!